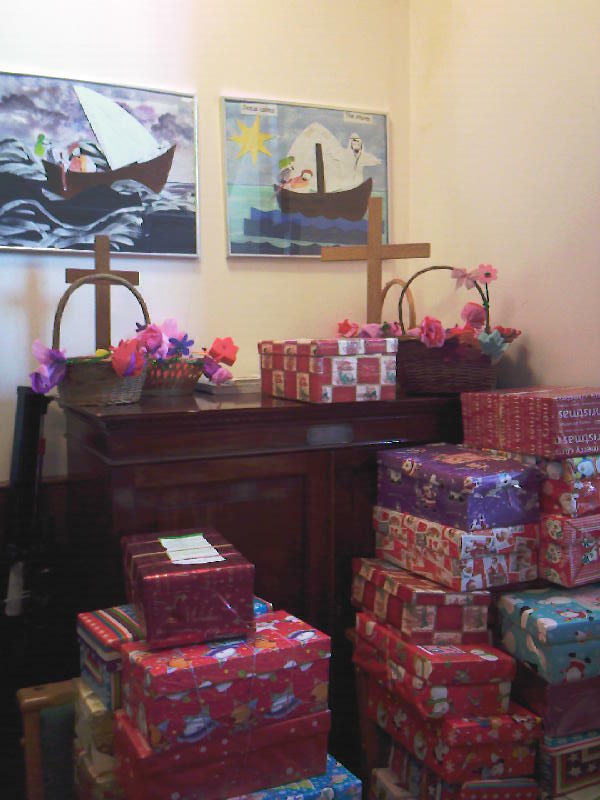 Sunday 19 November was Shoebox Sunday at St Columba’s. 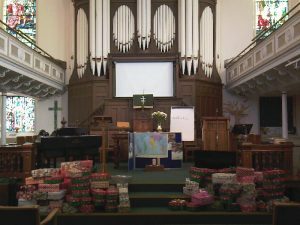 For many years, the church has supported Samaritan’s Purse’s Operation Christmas Child project. 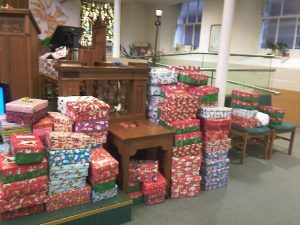 People from all over the area have been coming to drop off shoeboxes at the church, and many were added in today’s service. A couple of hundred boxes were piled up at the front of the church and blessed before heading out on a journey around the world. 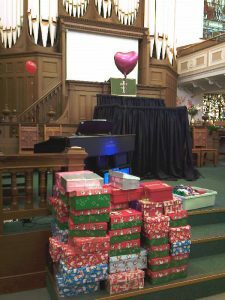 Each shoebox is filled with gifts such as toys, games, balls, paper and pens, hats, scarves, gloves, soap, toothpaste and brush, given with love, to be transported to a church in a poor country, for a child who otherwise might not get any Christmas presents. There is also an option for the child to learn about Jesus and the Christmas story. In today’s service, we reminisced on Christmases past, particularly those in the era of post-war rationing, when parents had little to give to their children in this country. Sunday 6 November was our Shoebox Sunday. We watched a moving video of the journey of a shoebox from the UK to children in Ukraine and Liberia. 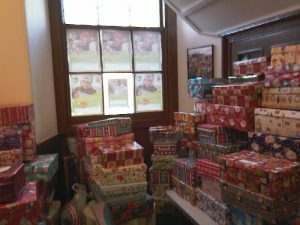 Operation Christmas Child has been running for 26 years, and now reaches 124 million poor children each year, providing each with a shoebox packed with gifts. 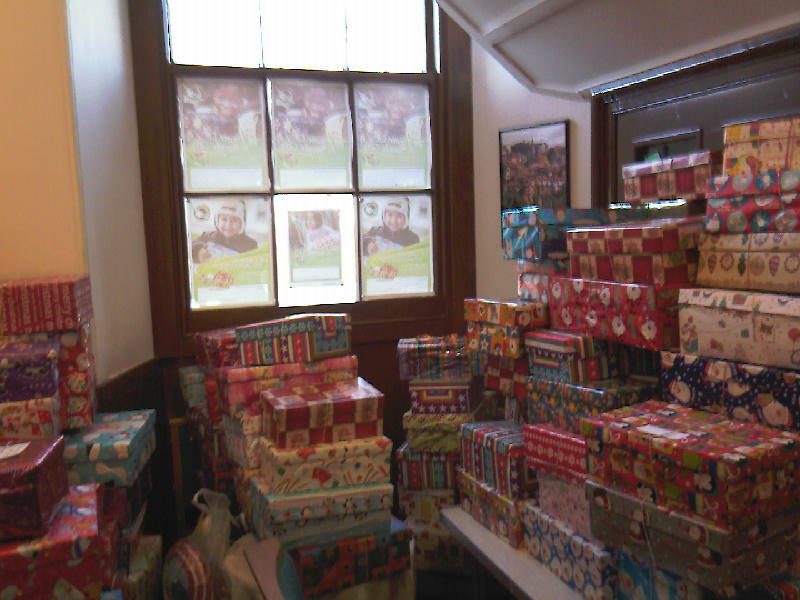 We collected 124 shoeboxes at St Columba’s, with the help of friends and local schools. Sunday also saw a triple baptism and a parade by our own 4th Tynemouth Beavers, Cubs and Scouts. Our morning service on Sunday 15 November took the theme of preparation. It was also Shoebox Sunday! Once again St Columba’s supported Operation Christmas Child, filling nearly 200 shoeboxes with gifts for children in other countries who would otherwise not get any Christmas presents. Such a big international effort requires a good deal of preparation. 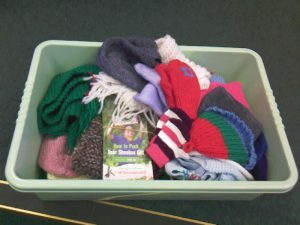 Some people had been knitting scarves, hats, gloves and toys all year to put in their shoeboxes. We reflected that we are so lucky – our treasured belongings would not fit in something as small as a shoebox. 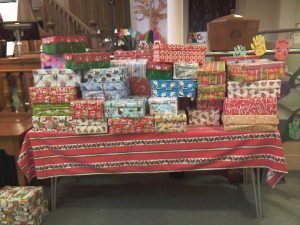 It was good to see the kindness and compassion that lead church members and friends to prepare shoeboxes, which would be taken to a collection centre for distribution around the world in time for Christmas. These reflect the Advent themes of hope, peace, love and joy, and will surely make a difference to less fortunate children. We also saw two short videos and a puppet show, bringing home the love that goes into the shoeboxes and the sheer delight that they bring to the children that receive them.